Cotton Spa Worsted - Buy 1 Bag Get 1 Bag Free; Limited time only. Ladder Ribbon Glitter is a delightful ladder ribbon yarn with a soft fine strand of glittery metallic lurex yarn woven throughout the yarn, giving it a touch of glitz and glamour. Ladder Ribbon Glitter is soft, light, cool and stunningly beautiful. 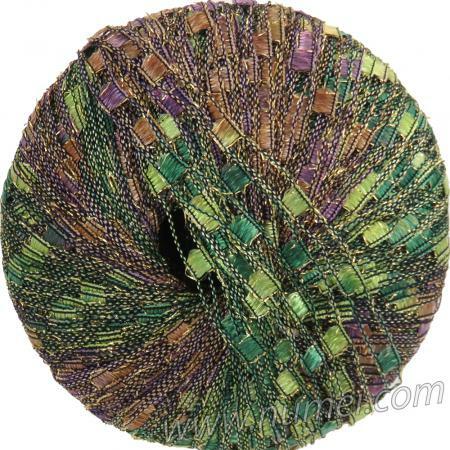 Its glittery look makes it ideal for evening wear, glamorous scarves, shawls, tops, sweaters, accessories and jewelry. Ladder Ribbon Glitter drapes beautifully and may be knit on a range of different sized needles to achieve different degrees of laciness. It is also color-coordinated with Ladder Ribbon, Ladder Ribbon Maxi, or East Track II so you may mix and match or use double-stranded for extraordinary color combinations. Ladder Ribbon Glitter may also be combined with another yarn such as Okimi Ribbon, cotton or wool yarn for extraordinary color combinations and textures. Gauge: 14 st & 20 rows = 4 in x 4 in on US Size 10 1/2 (6.5 mm) needles. Care: Handwash; Lay flat to dry. Width of yarn: Approx 1/8"
©2019 NuMei. All rights reserved.